I recently visited Isabelle's daycare to test a colourful activity that is perfect for younger children, but sure to please older children too. 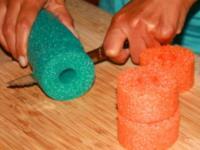 Since swimming pool noodles are easy to cut, simply use a knife to slice them. 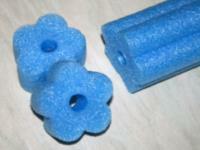 At the dollar store, I found flower-shaped swimming pool noodles. Once cut, these noodles turn into pretty flower-shaped beads. 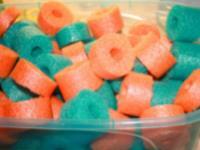 Once your swimming pool noodles are sliced, you will have several oversized beads that children will automatically be attracted to. Supervision is required with younger children who may be tempted to bite into them. Arrange your oversized beads around children on the floor. Encourage them to manipulate them. Give each child a long string. You may want to secure a noodle to one end of each child's string to act as a stopper that will prevent the other beads from falling off. 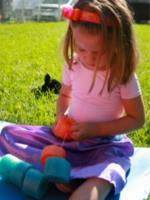 Invite children to thread beads onto the string. 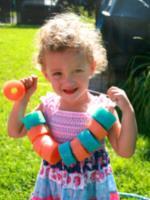 Of course, you can make pretty necklaces with these sliced swimming pool noodles. 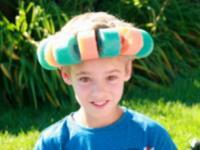 You can also make crowns or festive hats. As a group, you may choose to thread beads onto a very long string or ribbon to create a garland that can be hung within your daycare. Isabelle and the children in her group chose to create tiny caterpillars by threading a few beads one behind the other.